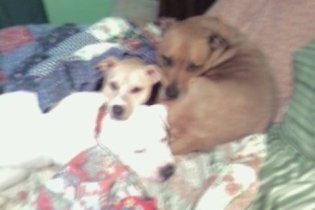 Jazz, Belle and Buster: Jazz we adopted from "Out of the Pits". He was 8 weeks old and now is 10 years old. Belle we also adopted from "Out of the Pits", but sadly to say she passed away at four years old from cancer which broke our hearts--especially Buster's--that was his girl. Buster (he is white) we rescued from a kill shelter. He was found at the dump. He is our 'junk yard dog'. :) What makes him special, he is deaf, which never stopped him joining in. He hears by our hand signs, love us with his kisses. The three make our lives full of love and they are characters. They love to kiss, go under the blankets and their tails wag so hard, they knock over chairs, lol. But they know the difference to be gentle when a toddler is around. They are the best family dogs, and my grandson was 6 months old when we first got Jazz, and now he is 10, they grew up with each other, along with Buster and Belle's short life. It does my heart good to see them snuggled together among blankets--loved and cared for. Enjoy your beautiful dogs and the one who waits at the rainbow bridge.